There are currently 245 people online. Active Media introduced a 64GB Mini 1.8" ZIF SSD for notebook. It's available online for $179 or for $189 in an upgrade kit with ZIF cloning adapter. 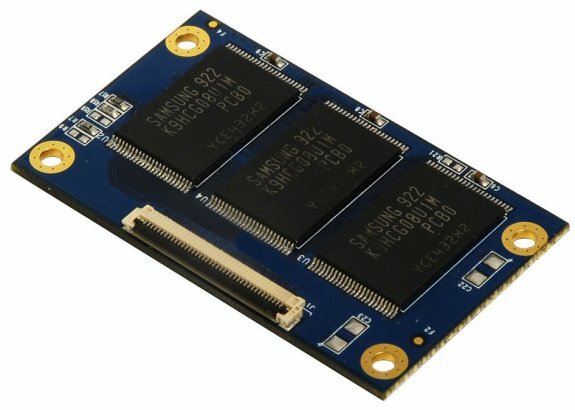 Active Media Products, a leading manufacturer of SSDs and DOMs, today began shipping a 64GB mini 1.8-inch PATA ZIF SSD that measures only 2.1 x 1.3" (54 x 32 mm) and is ideal for upgrading many popular laptops including the HP Mini 1000. This new SSD delivers transfer speeds up to 80MB/sec, which is substantially faster than most 1.8" PATA hard disk drives (HDDs), yet it is much smaller and lighter than an HDD. Active Media Products VP of Sales, Jerry Thomson stated, "We're pleased to finally offer the SaberTooth Z in a 64GB capacity. We've had so many requests from our upgrade customers for this product. This advancement demonstrates AMP's continued commitment to developing ever faster, more capacious solid state storage solutions." The SaberTooth Z accommodates a wide range of ZIF cable thicknesses that includes standard Toshiba and Hitachi cables, and it is 100% compatible with 40-pin ZIF HDDs. AMP sells the drive alone, or an upgrade kit that includes a mini screwdriver and a USB-ZIF cloning adapter to facilitate upgrades. The cloning adapter allows users to clone the contents of their existing HDD onto the SaberTooth Z without the need to reinstall all the applications.